Bug watch updates for Mandriva Linux are disabled. The information about this bug in Launchpad is automatically pulled daily from the remote bug. This information was last pulled on 2015-06-09.
nautilus but we will figure quite easily. I'll speak with upstream about that. Wasn't evince working on an OOo viewer? If they are then thumbnails for OOo docs will come along when that's finished, right? And the method from http://doc.gwos.org/index.php/Thumbnails_Ooo2 can't be used for dapper? Sadly I don't have anough knowledge to do that, but I'll try finding someone who can do it on the forums. Does this maybe belong in openoffice.org-gnome? I wonder if the python dependency would be a problem or not... The initial version of the script could be easily reworked to be in C using GnomeVFS (which isn't a new dependency) and zlib (which shouldn't be very problematic). But... all the image manipulation... I'm not sure about that. I suppose that could be done with gdk-pixbuf, which shouldn't be a problematic dependency either. gnome-app-install is written in python, IIRC, so that shouldn't be a problem. So again the question, why is the script at http://doc.gwos.org/index.php/Thumbnails_Ooo2 not appropriate? I'll work on getting this done for edgy. Voting against this in it's current form: tried it and removed it after short time. - The thumbnail background is transparent and it looks unreadable in any other view than nautilus window with white background (ex. Desktop with wallpaper). - Most spreadsheet previews look meaningless and one has to look explicitly at file extension to identify the type of file, which is much better reflected by the default icon. Presentations, Drawings and some text document may look better and more distinguishable. Try the updated script from http://ubuntuforums.org/showthread.php?t=76566, don't remember exactly which page, but I've attached a script that were posted on that thread. I hope someone will add this for a future version of Ubuntu, other distros like SuSE have had for a long time. So and what? Two years past and still we don't have this in Gutsy. Is it a complicated thing to add? It already works in Fedora 8, why not in Ubuntu? And also, will it disappear if i upgrade my system to another version (e.g. 8.04) ? one could really include it quite easily... any volunteers? of course it is supposed to read "taken from http://ubuntuforums.org/showthread.php?t=76566&highlight=odt+thumbnail&page=3 "
Gnome Bug about this which has just been closed as NOTGNOME and proposed to be filed under OOo bugs. Hubert Figuiere would like to remind us that libgsf (one of the libraries for Abiword) also ships a thumbnailer for ODF files, but since Ubuntu doesn't ship GNOME's office tools by default, and we do ship OpenOffice, this should be taken care of by OpenOffice. In general, this is an OpenOffice bug. The Nautilus bug was invalid since its creation. I read on the ubuntu-desktop mailing list that Tracker already can do this but maybe isn't enabled by default? i dont think this is correctly filed against tracker. 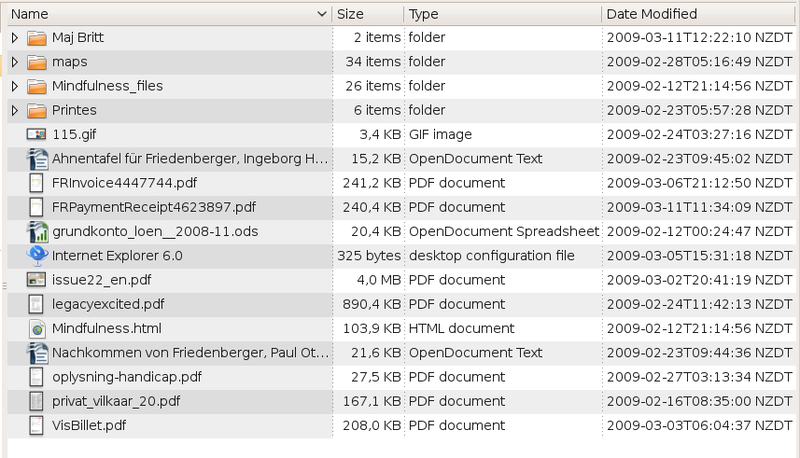 the bug i am talking about is that you do not get thumbnails for odt files in nautilus like you get for pdfs. i do not know too much of the technical details about thumbnail generation, but the only two programs that make sense to be responsible for generating and displaying the thumbnails are nautilus itself (or a plugin/addon) and the word processor (i.e. open office) (or a plugin/addon). It doesn't work yet in jaunty alpha… is it planned to be fixed for jaunty? Thanks I will look into this and try to get it in this week if possible. Unfortunately the code is listed as having no license at the moment so I can't upload it until it does. Also please switch it to using default python instead of python2.5 if possible or change it to use python2.6 if it has to be hardcoded. Also I think we need the authors real names in the copyright file and the python script, currently the python script has a place holder on the BSD license for the authors real name. This script was taken from http://ubuntuforums.org/showthread.php?t=76566 , was taken without permission. Keeping one bug task open is enough; closing the tracker one. My woe with that (aside from the license issues above) is that this will call a new Python instance for each and every OOo document that you have in a directory. This is a very expensive operation, so it'll drain a lot of CPU and I/O resources. Of course this is equally true for video thumbnails, which are also awfully expensive. I just wonder whether we should aggravate the problem with more file types, by default. But aside from that, of course there is no reason whatsoever to not put it at least in universe. For jaunty, getting it into main and installed by default is a bit late. @pitti: what would be a solution ? Rewriting in C ? Are there better ways to do thumbnails? Rewriting in C would reduce the overhead significantly already. I'm afraid I don't know whether there are better ways; maybe the code can be integrated into some existing thumbnailer, to reuse its build system and programs. But as I said, while this is an opt-in, and not installed by default, then efficiency doesn't really matter much. We could just use an sh script (which is what thunar does already using ImageMagick. http://goodies.xfce.org/projects/thunar-plugins/thunar-thumbnailers/).. the only reason its in python at the moment is some niceness about not templating the ~/Templates and making the background color white instead of transparent. /tmp/nautilus-thumbnail.png looks just fine to me. Looks like this has been implemented in jaunty, see the attached image of my nautilus window. I've written a thumbnailer bash script, that uses imagemagick if it's installed, if not, totem-gstreamer-video-thumbnailer. Unfortunately, the latter puts "film strips" or "film rolls" in the image, giving the user the impression that the file is a video, not a document. Any one know how I could disable this behaviour? Is there another program that's installed by default that I could use? evince-thumbnailer unfortunately keeps the transparency in the image. It's now sitting in new waiting to be processed for universe. I have it uploaded to revu with some changes, once it is approved I will send the resulting debdiff back to Flimm. I have uploaded the resulting package from going through REVU process to jaunty but it is waiting in NEW. has this made it to jaunty? if not, will it be in karmic? The package is in Karmic, but obviously won't make it into Jaunty. Though it could be marked as 'Fix Released' I guess. can you provide a link to it on packages.ubuntu.com? i cannot find it there. will open office depend on it? and if yes, what version of open office (standard or full) will depend on it? could you fix it in the package and re-upload? thanks! I've discovered a packaged that does this already: libgsf-bin. It also handles Microsoft Office files. All its dependencies are included in the default install. Is there any way I can suggest it be included by default?